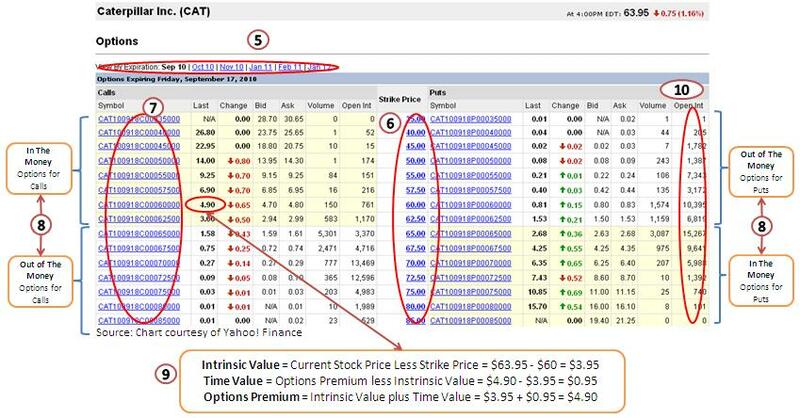 A successful execution of options strategies depend on a thorough understanding of option trading basics. 1) What are Stock Options? 4) Advantages and disadvantages of options? 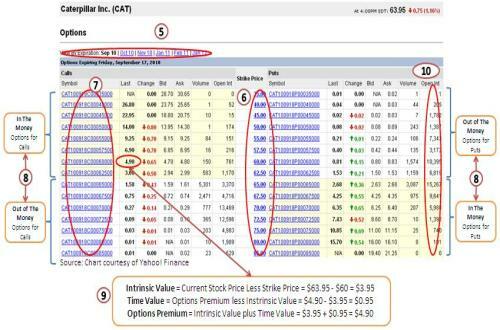 Below is an example of option table for Caterpillar Inc. (CAT). All these quotes will not be so confusing after you have learnt the basic option trading knowledge. A complete understanding of the option trading basics will help an option trader to decide which option strategies is most suitable to him, or is he suitable for trading option. One of the important issues to take note is that an option buyer can lose his entire investment in a short time. Uncovered option seller may be subjected to a even bigger financial risk. Keep in mind that most option traders have many years of trading experience. So don't expect yourself to be an expert in options trading after absorbing the above information. On the other hand, do not feel intimated by the large amount of information that is coming your way. Take your time and learn at your own pace. If you have understood the fundamental of option trading and the risk involved, let's move on to find out how the various options trading strategies may help you to profit in different market conditions. Give You A Hard Time? Use this space to discuss on the basics of options trading, share your knowledge on essential options concepts or how options might fit into your trading portfolio. Everyone is welcome and you can ask a question or comment on any topics that you are interested. It's free, educational and easy to do! Join in! Your questions or comments will appear on a Web page exactly the way you enter it here. You can wrap a word in square brackets to make it appear bold. For example [my story] would show as my story on the Web page containing your story. Do you have some pictures or graphics to add? Great! Click the button and find the first graphic on your computer. Select it and click on the button to choose it. Next learn how to apply various Options Trading Strategies to help you make profit on different market conditions.